New Year’s celebrations came grinding to a halt in Dubai after a five-star hotel was engulfed in a fire just moments before a spectacular fireworks display was due to begin. 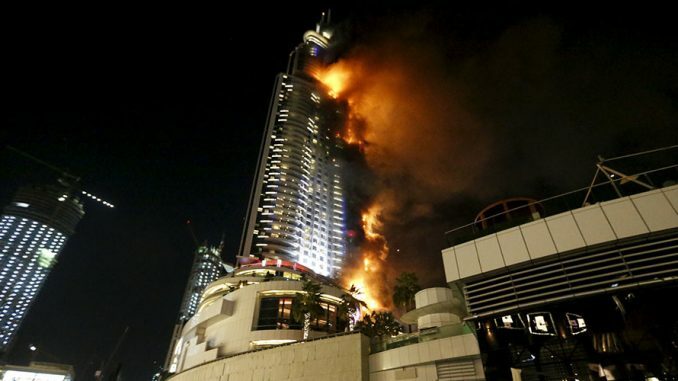 The huge building caught fire at 9:30pm Dubai time, with flames engulfing over 40 stories of the 63 story building. Those who escaped described how people climbed over each other in their rush to escape the burning building. One Briton was forced to carry his disabled mother on his back. A medic has revealed that at least 60 people were hurt, many with crush injuries, with officials saying one person suffered a heart attack. The hotel would likely have been packed with people waiting in their rooms for the best view of the fireworks display at the Burj Khalifa, the world’s tallest skyscraper, which sits just across the lake from The Address. Those waiting below found themselves in danger of being struck by burning debris falling from the building. Angus Villar was in the hotel on the 15th floor when his father noticed the room next door was on fire. He told Sky News he was forced to carry his disabled mother on his back to escape. Mr Villar described it as ‘pandemonium’. ‘It was the classic thing where you would expect women and children first, but no. People were shoving each other down the stairs and climbing over each other,’ he said. Fire engines struggled to get through the crowds to the fire, which started on a terrace on the 20th floor, according to reports. Police had already cordoned off roads in the area in expectation of a million people attending the vent. Those who had arrived early to grab the best spots were forced to flee the blaze, yet despite the panic, the authorities have said the display is still going ahead. They have also said no one was hurt in the blaze at the 300 metre tall building, and everyone had been evacuated safely. The fire was almost entirely out by 11pm Dubai time, authorities said. However, at midnight the fire was still blazing. This did not stop the New Year celebrations, and the fireworks went ahead at the Burj Khalifa, just 500 yards away from the smoldering building. Tens of thousands of people whistled and cheered at the show while teams of firefighters were working to put out the blaze. An hour earlier, officials had been keen to play down the severity of the fire as they promised the display would go ahead. ‘There are no injuries, thank God … of course, it will not affect the celebration,’ Major General Rashed al-Matrushi, general director of the Dubai Civil Defence, told Al Arabiya. However, their statements were later amended. The Dubai Media Office said 14 people had been lightly injured and that one suffered a heart attack due to the smoke and overcrowding during evacuation. The statement said another person was moderately injured, without elaborating further. No children were among those injured. The fire began at about 9.30pm, and is said to have taken hold of the outside of the building within minutes. Tom Stroud, 35, an eyewitness who is on holiday in Dubai, said: ‘There was no bang or bomb-like sound, we just looked over and saw an inferno. Atieh S (@AtiehS), who watched from a nearby building, said the fire took hold in just five minutes. Mohammed Al Sarraf, told The National the fire was ‘raging’. The city is planning on three spectacular displays, beginning at the Burj Khalifa, which organisers said was fitted with 400,000 LED lights. They said 1.6 tons of fireworks would be used in the display. The Downtown is just across a lake from the Burj Khalifa, facing each other. It also towers over the Souq Al Bahar, a popular shopping area with walkways that connect the Burj Khalifa and the Dubai Mall. Many people will have been in their rooms, ready and waiting for the spectacular display to begin. From there, the fireworks were to light up the sky around the sail-shaped Burj Al Arab and later down near the Dubai Marina. Fireworks also will be on display in Abu Dhabi, the capital of the country of seven emirates. It is the second blaze at a Dubai skyscraper this year, after the Marina Torch tower was engulfed in flames in the early hours of February 21. Hundreds of people were evacuated from one of the world’s tallest residential buildings, as a large blaze ripped through multiple floors of the tower. After firefighters extinguished the blaze, residents could see the external cladding on the corners of the building was charred black and mangled for dozens of floors. Nobody was killed, but seven people were treated at the scene for smoke inhalation.